Part of Molecular Medicine Partnership Unit "Stemcell-niche networks in ageing and disease"
Despite increasing use of targeted therapies in the treatment of acute myeloid leukemia (AML) long term survival is rare in particular in elderly patients. Development of next generation sequencing (NGS) technologies providing detailed information on genetic lesions present in tumor genomes has improved risk stratification and paves the way for personalized therapy. Nonetheless, especially patients with high risk mutations often do not benefit from aggressive therapy regimens, which bear themselves the risk of treatment related mortality. One major cause of relapse in AML is supposed to be the lack of therapies that permanently eradicate leukemia stem cells (LSCs). When human AML patient cells are transplanted into immunocompromised mice only a small fraction of cells is able to home to the bone marrow and recapitulate the human disease. 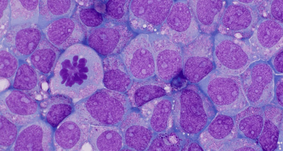 These cells are called leukemia initiating, leukemia propagating, or leukemia stem cells. LSCs are considered to be the cause of relapse of the disease. They share certain features with normal hematopoietic stem cells such as higher resistance to chemotherapy and the capacity to self-renew. Due to these characteristics it is obvious that only efficient eradication of these LSCs will lead to long-term disease free survival. Our group aims to understand the similarities and differences between normal and malignant stem cells and to use this knowledge to develop more efficient therapies for AML patients. Despite increasing use of targeted therapies in the treatment of acute myeloid leukemia (AML) long term survival is rare in particular in elderly patients. Development of next generation sequencing (NGS) technologies providing detailed information on genetic lesions present in tumor genomes has improved risk stratification and paves the way for personalized therapy. Nonetheless, especially patients with high risk mutations such as mutations in the tumor suppressor gene TP53 often do not benefit from aggressive therapy regimens, which bear themselves the risk of treatment related mortality. Our aim ist o identify specific gene networks in AML with high molecular genetic risk using NGS technology, proteomics and in vivo models. Leukemics Stem Cells (LSCs) can be distinguished from non-LSC blasts by their potential to engraft immunocompromised mice, in which they reinitiate the human disease. As they are supposed to be the cause of chemoresistance and relapse their eradication is a prerequisite for long term therapy success. Fig. 1: Primary AML patients cells maintain their immature morphology in presence of optimized culture conditions (shown here day 4 in culture). Our methods comprise in vitro manipulation of primary human AML cells and healthy hematopoietic stem cells, which we isolate from human cord blood. To avoid rapid differentiation upon in vitro culture we have optimized culture conditions for primary human cells including the use of small molecule (Fig. 1). We knockdown and overexpress genes in primary cells using lentiviral transduction. Furthermore, the use of xenotransplantation models (NSG, NRGS mice) still represents the gold standard to assess stem cell activity. With these approaches we aim to better understand the biology of normal and malignant stem cells and to develop more efficient therapies for AML patients. 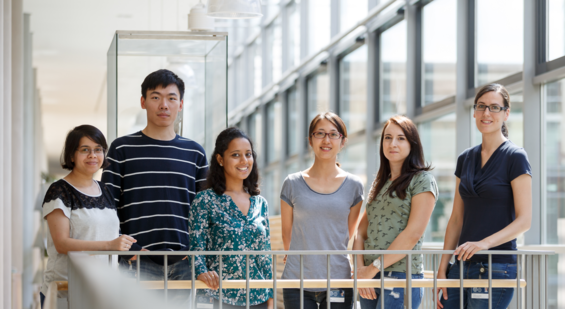 Medical students searching for a project can send their application to caroline.pabst@med.uni-heidelberg.de. Lin, H. H., C. C. Hsiao, C. Pabst, J. Hérbert, T. Schöneberg, J. Hamann. 2017. Adhesion GPCRs in regulating immune responses and inflammation. Adv. Immunol., (in press). 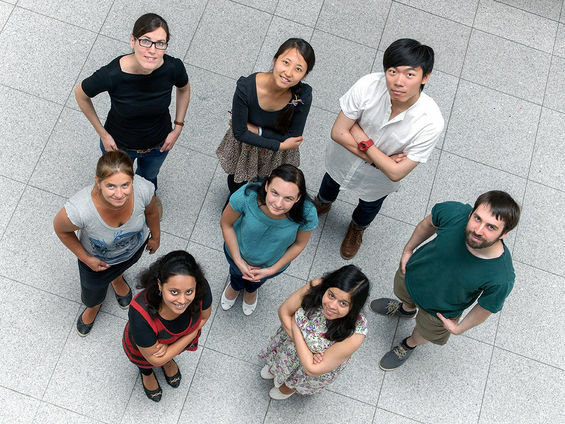 F. Zhou, Y. Liu, C. Rohde, C. Pauli, D. Gerloff, M. Köhn, D. Misiak, N. Bäumer, C. Cui, S. Göllner, T. Oellerich, H. Serve, M.P. Garcia-Cuellar, R. Slany, J. P. Maciejewski, B. Przychodzen, B. Seliger, H.-U. Klein, C. Bartenhagen, W. E. Berdel, M. Dugas, M. M. Taketo, D. Farouq, S. Schwartz, A. Regev, J. Hébert, G. Sauvageau, C. Pabst, S. Hüttelmaier, C. Müller-Tidow. AML1-ETO requires enhanced C/D box snoRNA/RNP formation to induce self-renewal and leukemia. Nature Cell Biology (2017) NCB-M31790B. Göllner S, Oellerich T, Agrawal-Singh S, Schenk T, Klein HU, Rohde C, Pabst C, Sauer T, Lerdrup M, Tavor S, Stölzel F, Herold S, Ehninger G, Köhler G, Pan K-T, Urlaub H., Serve H, Dugas M, Spiekermann K, Vick B, Jeremias I, Berdel WE, Hansen K, Zelent A, Wickenhauser C, Müller LP, Thiede C & Müller-Tidow C. Loss of the histone methyltransferase EZH2 induces resistance to multiple drugs in acute myeloid leukemia. Nature Medicine. 2016. Lavallée V-P, Krosl J, Lemieux S, Boucher G, Gendron P, Pabst C, Boivin I, Marinier A, Guidos CJ, Meloche S, Hébert J, and Sauvageau G. Chemo-genomic interrogation of CEBPA mutated AML reveals recurrent CSF3R mutations and subgroup sensitivity to JAK inhibitors. Blood (2016). doi:10.1182/blood-2016-03-705053Polprasert C, Schulze I, Sekeres MA, Makishima H, Przychodzen B, Hosono JA, Padgett RA, Gu X, Phillips JG, Clemente M, Parker Y, Lindner D, Dienes B, Jankowsky E, Saunthararajah Y, Du Y, Oakley K, Nguyen N, Mukherjee S, Pabst C, Godley LA, Churpek JE, Pollyea DA, Krug U, Berdel WE, Klein H, Dugas M, Shiraishi Y, Chiba K, Tanaka H, Miyano S, Yoshida K, Ogawa S, Muller-Tidow C, and Maciejewski JP. Inherited and Somatic Defects in DDX41 in Myeloid Neoplasms. Cancer Cell 27, 658–70 (2015). Pabst C, Krosl J, Fares I, Boucher G, Ruel R, Marinier A, Lemieux S, Hebert J, Sauvageau G. Identification of small molecules that support human leukemia stem cell activity ex vivo. Nat Meth 11, 436–442 (2014). Pabst C, Schirutschke H, Ehninger G, Bornhauser M, Platzbecker U. The graft content of donor T cells expressing gamma delta TCR+ and CD4+foxp3+ predicts the risk of acute graft versus host disease after transplantation of allogeneic peripheral blood stem cells from unrelated donors. Clin. Cancer Res. 13, 2916–2922 (2007).